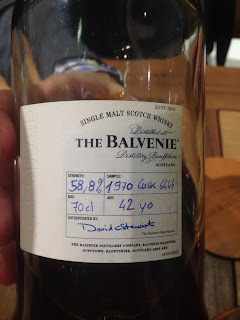 I happened to be walking past the Balvenie stand and noted that they were pouring whisky from a bottle with a handwritten label. I managed to catch them just as they were trying to hide it underneath the stand and asked what it was. 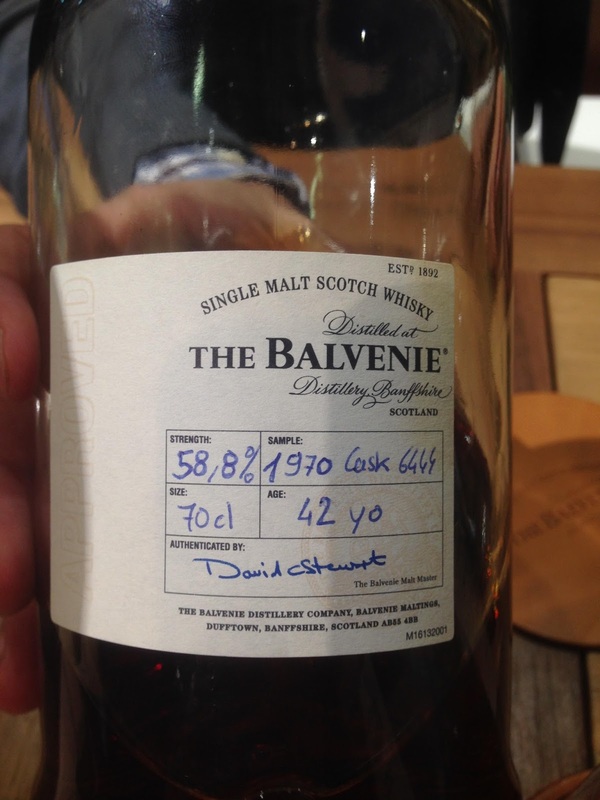 Turns out David Stewart had just done a masterclass at Whisky Live Paris and this was the final whisky from the tasting. A 1970 Single Sherry Cask, bottled at 42 years old. I also tried the 17 Doublewood as a kind of warm up. Nose: Really classically fruity, lots of honey and nice florals. Taste: Fruity and sweet, honey, nicely balanced. Finish: Medium/long length. Honeycomb and beeswax. This is a really nice one and a big step up from the 12 (which I’m not too fond of). Nose: Like any great Balvenie, this just oozes class. Antique, leather, Sherry, orange blossom, cherry, old polished wood, old antique furniture, really complex and balanced, slight medicinal note with cough sweets. Cocktail cherries too. Amazing nose. Taste: Sherry arrival, so soft, so epic. Old wood, dry oak, layers of complex spices, orange blossom, crystallised honey, beeswax, oily amazing mouthfeel. Finish: Medium/Long length. Sweetness goes, then dry oak, leather and chocolate come back with some spice. Not as amazing as the nose and taste, a little too dry. WOW! Layers and layers to the taste, just keeps developing in the mouth. Emotional. Extraordinary. If the finish hadn’t been a little too dry, this could have been my first 93! This makes Balvenie the only whisky so far (not for long) the only distillery with two whiskies on my 90+ list, after the awesome Tun 1401.